Paul Nandra studies Active Galactic Nuclei (AGN), galaxies which have a supermassive black hole at their centers spewing vast amounts of energy out into space. 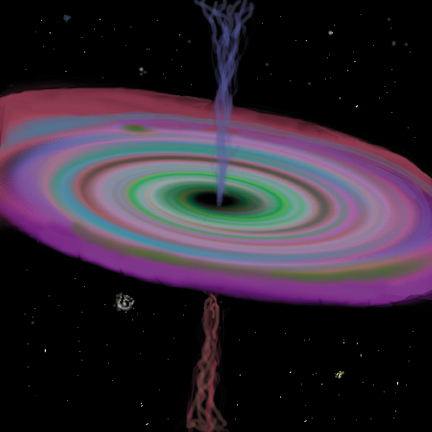 This artist's conception shows what an AGN might look like: matter falling into the black hole spirals around in a disk, heated to incredible temperatures as it falls in. The heated matter glows, not only in the colors of visible light, but also in x-rays. Two jets of high-energy particles shoot out of the disk, propelled by the enormous energy of the central black hole. Tell me more about AGN!